Axon Medchem BV is a chemistry service platform, spinned-off from Axon Biochemicals BV. Together with Axon Biochemicals BV, it conducts business operations as a contract research organization (CRO) in medicinal chemistry. 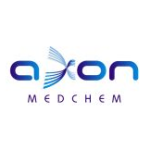 Axon Medchem BV is specializing in contract research and high-quality synthesis of bio-active and/or drug-like molecules. The company aims to provide dedicated chemistry services for the pharmaceutical, biotechnology, (bio-)chemical and/or agricultural companies as well as research institutes around the world. Axon Medchem is also a prime source of high-value life science products, providing Axon Ligands (TM) for pharmaceutical research as world-wide recognized drug standards.